Live Your Poem...: ARTSPEAK! 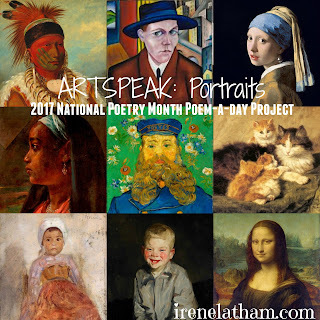 Portraits poem "Morning"
Hello and Happy National Poetry Month! Here it is, Easter! Happy Easter!! And also day 16 of ARTSPEAK! : Portraits, my National Poetry Month poem-a-day project, during which I am looking, listening with my spirit ear, and asking these subject to share with me their secrets. But first: Be sure to check in with Joy at Poetry for Kids Joy to see how our Progressive Poem is progressing! the lake is my pillow. I rest on the ancient.